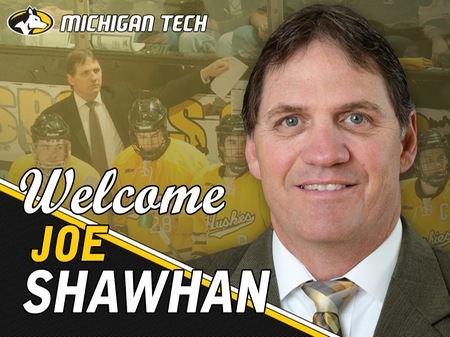 HOUGHTON, Mich. – Joe Shawhan [Shawn] has been named the 22nd head coach of Michigan Tech hockey team Dr. Suzanne Sanregret announced Tuesday (May 30). Shawhan is a 20-year veteran of hockey coaching with over 10 years in college and 10 years in junior hockey. He has been an assistant coach for the Huskies for the past three seasons. “I’m thrilled to introduce Joe Shawhan as the head coach of our historic hockey program,” Sanregret said. “He has been an instrumental part of our success over the last three seasons, and winning has followed him in every program he has been a part of. “I am honored and excited for the opportunity to remain a part of the Michigan Tech family,” Shawhan said. “The past three years have been an amazing journey. Sharing in the passion this community has for this university and hockey program has been an experience most only dream of. Tech hockey has a colorful history painted by legendary individuals and teams. My family and I are excited to be part of the next chapter. Shawhan was brought on staff at Tech in July 2014 to work with the goaltenders and defensemen. Tech went 75-34-14 during his three seasons, going to the NCAA Tournament twice, winning the MacNaughton Cup in 2015-16, and the Broadmoor Trophy in 2016-17. The Huskies were ranked in the top two in the WCHA, and top 10 in the nation, in goals against average all three years. Goaltenders Jamie Phillips and Angus Redmond flourished under Shawhan, breaking Tech records and leading the Huskies back to the NCAA Tournament for the first time since the 80s. Phillips left as Tech’s all-time shutout leader, was a two-time All-WCHA selection, named the WCHA Outstanding Student-Athlete, and was a finalist for the Senior Class Award, and the Mike Richter Award. He signed a two-year contract with the Winnipeg Jets after his senior season in 2015-16. Redmond played one season at Tech, going 22-10-5 with four shutouts. His 22 wins were tied for ninth in the nation and set a Michigan Tech record for wins by a freshman goaltender. Redmond was a WCHA All-Rookie selection and signed a three-year contract with the Anaheim Ducks. Before coming to Tech, Shawhan spent six seasons at Northern Michigan. He was a volunteer assistant in 2007-08, the director of hockey operations in 2009-10, and an assistant coach for four seasons. He coached current Detroit Red Wing and Grand Rapids Griffins goaltender Jared Coreau. Shawhan was also an assistant coach at his alma mater Lake Superior State from 2005-08. As the head coach and general manager of the Soo Indians from 1995-2005, Shawhan compiled a 474-162-43 record to become the winningest coach in the history of the North American Hockey League. He had two 50-win seasons, six 40-win stints, and two seasons with over 30 victories. Under Shawhan’s guidance, the Indians never recorded a losing record, captured three NAHL titles, and earned four trips to the USA National Tournament. He was a three-time recipient of NAHL Coach of the Year honors and had more than 120 of his former players go on to play Division I college hockey, including Cam Ellsworth (Michigan Tech) and Hobey Baker Award winner Ryan Miller (Michigan State). He also coached Tim Blashill the brother of current Detroit Red Wings head coach Jeff Blashill. Shawhan earned four letters as a goaltender for LSSU from 1982-87, where he amassed 1,130 saves. He led the CCHA in both goals against average and save percentage during the 1985-86 season and left the program tied for first all-time in career GAA at 3.83. An active member of USA Hockey, Shawhan led the 2004 U.S. Junior National Team to a silver medal at the 2004 Viking Cup in Alberta as head coach and bronze medal in 2002 as an assistant. He also served as the head coach of Team Michigan U-17 and U-18 five times and was a member of the USA Hockey Tier I Oversight Committee. The Sault Ste. Marie, Michigan, native holds a bachelor’s degree from NMU in technical and applied sciences. He and his wife, Laura, have three children, Mia, Jordan and Rachel. Jeff Blashill (Detroit Red Wings Head Coach) – When I got my first head-coaching job in Indiana, one of the first calls I made was to Joe Shawhan for advice. I had always been extremely impressed with the job Joe did as the head coach of the Soo Indians. I thought he always maximized his team’s talent level, and my brother played for him as well. That was one of the first calls I made to pick his brain on ways to be an effective head coach. I think Joe is somebody who has great hockey knowledge. I think he understands what it takes to win, and is a lifelong student of the game. He will be an excellent head coach for Michigan Tech. Ryan Miller (Vancouver Canucks Goaltender) – Michigan Tech is getting a guy who really cares about his players and prides himself in watching them develop into their full potential. 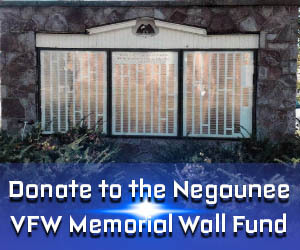 That is something that is really important at the college level. Jeff Jackson (Notre Dame Head Coach) – I spent a lot of time with Joe at Lake State both as his coach for one year and afterwards during his time with the Soo junior team. I learned to respect Joe for his knowledge and passion for the game. He’s paid his dues and he is very deserved of getting the opportunity to become a head coach. He’s worked for some good people and that has only accelerated his development as a coach. Joe’s a good man, and I’m really happy for him. Jamie Phillips (Manitoba Moose Goaltender) – Joe is definitely a tremendous asset to Michigan Tech hockey. Tech has had nothing but success since he’s been there, and he cares passionately about the players, the program, and especially the community. He wants to put a winning program together and be a winning program for years to come. There’s no better choice than Joe to be the head coach, and I’m very pleased to hear that he is the choice.